1) In Denver, Exhibits Interweave Genres — that’s the headline, but it doesn’t really say what the story is about. As you may know, the Denver Art Museum has two buildings, with the older Ponti building containing more of the permanent collection and the newer Libeskind building presenting more of the special exhibitions. Visitors usually don’t go to both. So director Christophe Heinrich devised a solution — a campus-wide theme for this summer in which all, or most, curatorial departments are presenting an exhibition. This summer, it’s called SPUN. 2) Country Music Temple Stays In Financial Tune — This is about the Country Music Hall of Fame and Museum, and its unique financial model. The Hall — which is an accredited museum, typically gets around 80% of its annual budget from earned income. Discuss: What’s the applicability to art museums? We will. 3) Examining Sargent’s Shift From Oils to Watercolors — You know some of these watercolors, but not all, and you probably don’t know the story of how the Brooklyn Museum, first, and then the Museum of Fine Arts, Boston, purchased Sargent’s ground-breaking watercolors in bulk and how they came to be united for the first time in a traveling exhibition this year. Sargent is getting the illustration for this post — that’s his In a Medici Villa at left. You can also see here a summary of the upcoming exhibitions around the country that I’ve chosen as noteworthy for NYT readers. 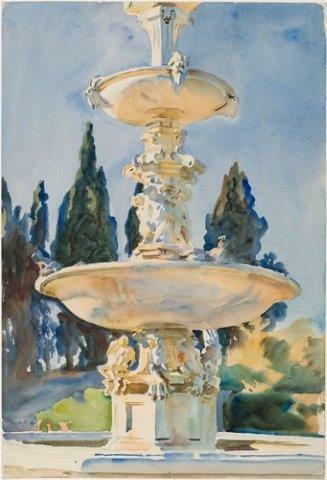 Lovely piece about the Sargent watercolors in Brooklyn and Boston. Fascinating. Thank you!